Now that I'm hunting for singles again, I sometimes find 7" singles that I never thought were even released. And this one is a good example. 'The silence in my heart' was released as a 1-track cd-single in 1992. Around that time, most Dutch record shops weren't stocking 7" singles anymore, and the one address I still visited regularly never had this single. Now, 18 years later, I found not one, but five copies of this single tucked away in a closet in a second hand shop. 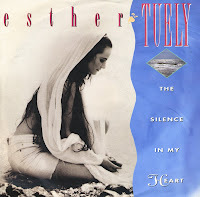 'The silence in my heart' is Esther Tuely's most accomplished song, and it is still a mystery to me why this didn't turn out to be a hit. Taken from Esther Tuely's self-titled debut solo album, 'Eye of heaven' was her second single. It didn't reach the Dutch Top 40, just like the third single, 'Silence in my heart', which wasn't released on vinyl anymore - only on a one track cd-single. Esther Tuely was awarded a Golden Harp - a Dutch music prize - in 1991, meant to encourage her to go on with making music. It didn't have the desired effect: she would not release a second album at all. Esther Teule was born on October 30, 1963 in Vancouver, Canada. In the eighties she became a singer in the Dutch disco band the Novo Band. In 1991 she recorded her first (and only) solo album, the self-titled 'Esther Tuely'. 'Incredibly red' was the first single drawn from this album. It became a modest hit in the Netherlands.